If you are driving back to school, it is important that you have your car serviced prior to leaving. 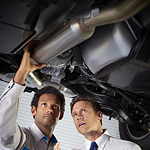 Ideally, you will get the tires rotated, the oil changed and the engine inspected. It is also a good idea to bring a vehicle in for service when a dash light comes on. Having the vehicle checked out will reduce the chances of significant damage. You should check your owners manual to determine if you need to have fluids flushed or other maintenance done at 30,000, 60,000 or 100,000 miles. Fluid levels should be checked and topped off before bad weather starts to set in. Bringing your car or truck to The Car Store can make it easy to take care of service needs in a timely manner. You can generally schedule an appointment by calling during business hours or stopping by our location at your earliest convenience.